With a couple of hours and a couple of dollars, I made a cute $5 DIY Owl Costume for one of my 6-year-old daughters. Even better, this is no-sew! 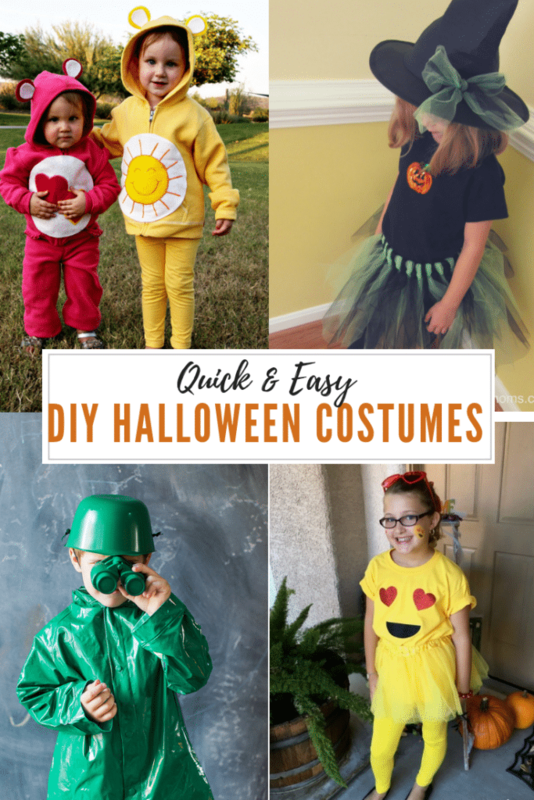 Halloween doesn’t have to be expensive. 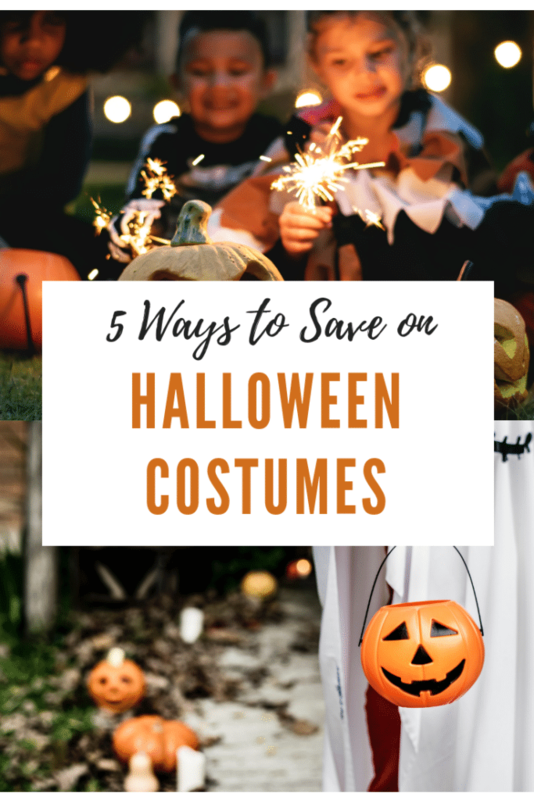 Just like last year, time and creativity trump money when it comes to costumes. If you think you’re not creative, you can just copy ideas off the internet like I do. Start by finding some inspiration. 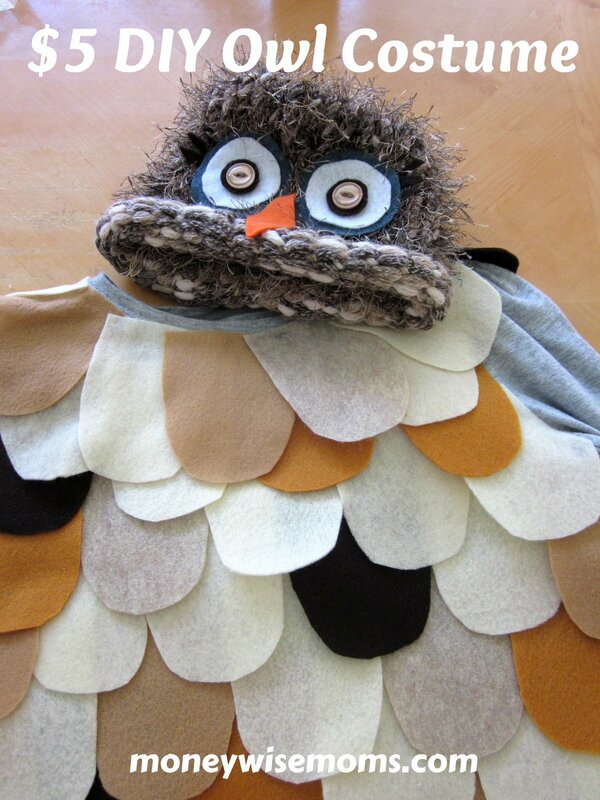 I went to Pinterest for ideas, but most of the DIY owl costumes I found required sewing. I had to make it simpler, so I figured I could use a hot glue gun instead. And felt is really easy to cut and work with. If your child would prefer another bird, just use different colors that are more vibrant. If I’d had an old shirt of her brother’s, I would have used that, but I bought a grey t-shirt at a thrift store for $1 instead. I don’t sew, so using a shirt meant I didn’t have to construct anything. 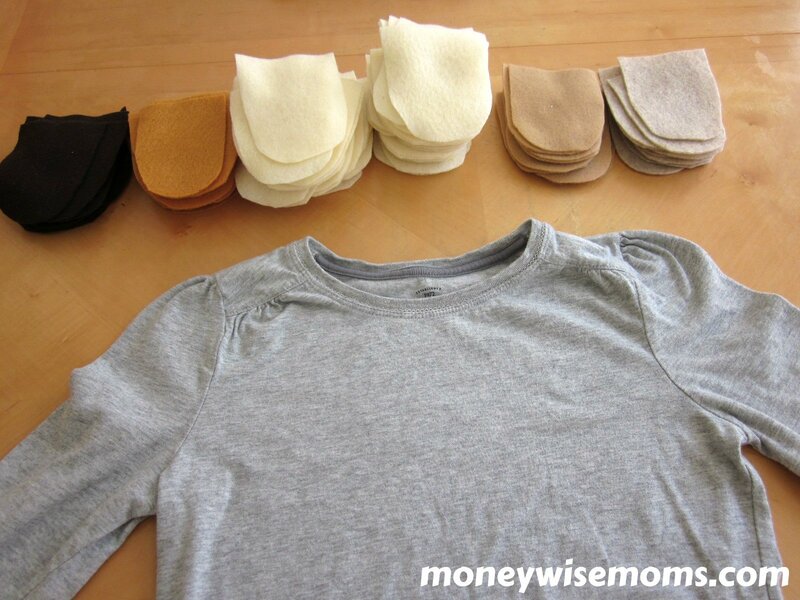 You can use a long-sleeved tee or sweatshirt as the basis for many costumes. I cut a piece of cardboard into a U shape (for feathers) and cut a bunch out of felt. 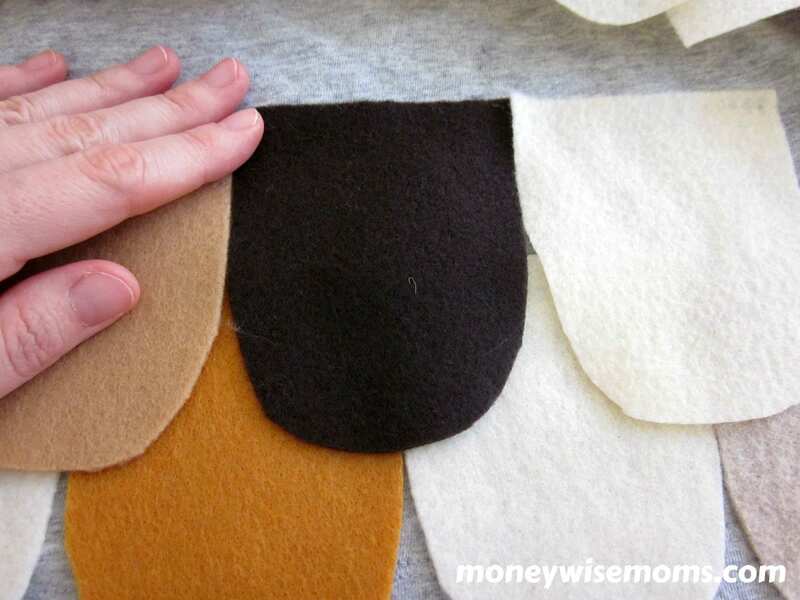 I had some felt already, and I bought a bunch of the .23 sheets at Walmart in owl-y colors. This technique would work with many kinds of animals; just adapt the shape to whatever animal you’re making–feathers, fur, stripes, etc. I don’t sew, but I can glue. I glued the feathers in lines–on both the back and front of the shirt. Then I went back over the collar to make it more round. I couldn’t believe how heavy the shirt was when I was done–at least she’ll be nice and warm on Halloween night! My daughter wore dark grey leggings (that we already had) for the bottom of the costume. Any dark pants or leggings will do. My inspiration costumes used masks, but I didn’t want my daughter to have trouble seeing when we’re out trick-or-treating. I found this fuzzy knitted hat at the thrift store for $1. My daughter and I cut circles out of felt . She chose the buttons from our stash, and we glued them onto the hat with the hot glue gun. I cut a little beak out of orange felt, too. 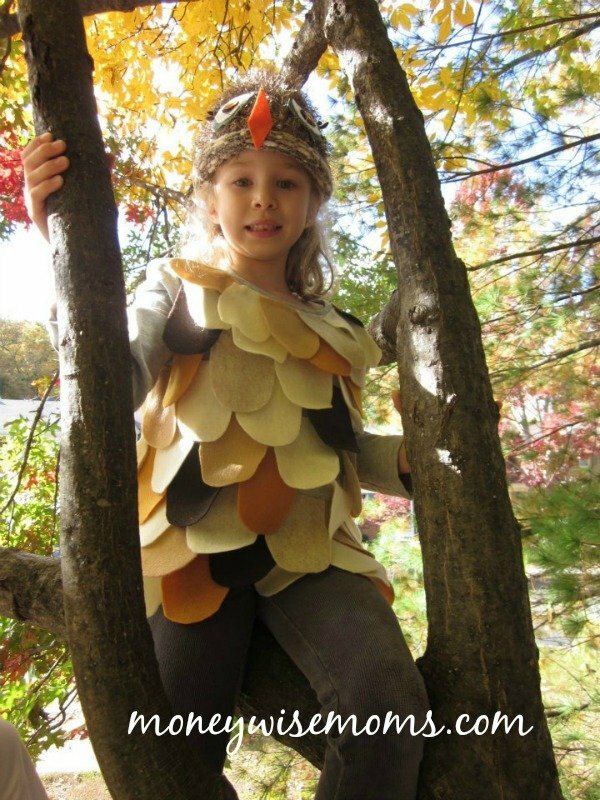 The hat colors dictated the feather colors for the costume. 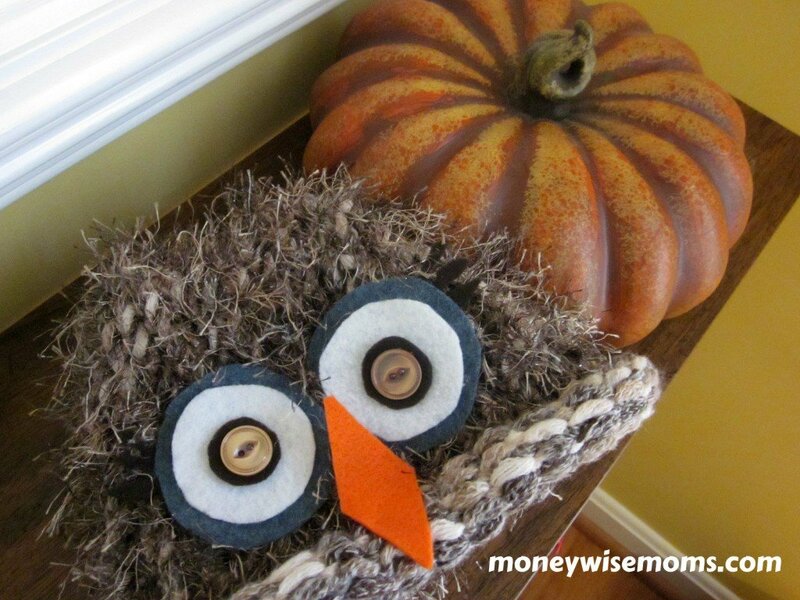 My daughter absolutely loves this DIY Owl Costume! She wore it to a Halloween party last weekend, and only one feather came loose, so I just glued it back on. A couple of hours + a couple of dollars = happy mom and happy child. Yippee!